For many travelers the concept of an all-inclusive resort brings to mind vivid images of buffet food enveloped in a swarm of winged wildlife, drinks with only a hint of alcohol, strategically hidden extra charges, and an overall commitment on the part of the destination to embrace mediocrity as the benchmark of success. Luckily, that is becoming more the exception rather than the rule. Even in Jamaica, where the industry has historically struggled to offer an upscale all-inclusive experience, there are a few shining stars including Sunset at the Palms. Here, guests have options and opportunities and while still affordable, the slightly higher price point and smaller more intimate setting tends to attract a clientele that is discerning yet not demanding who simply want a place to relax, to eat, drink, and be merry with out the hassle of having to plan each moment of the vacation. Sunset at the Palms is an adults-only, all-inclusive retreat nestled on the Caribbean shores of Negril, Jamaica. 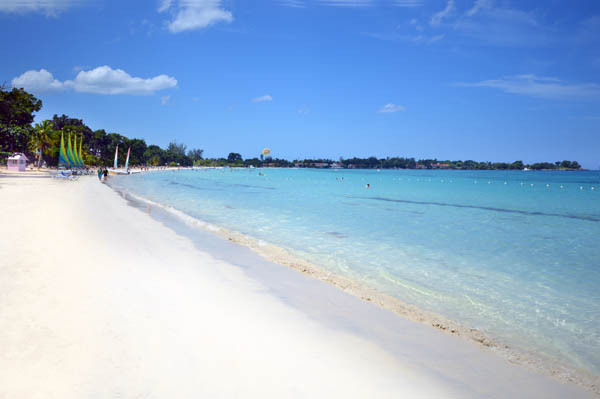 A scenic, sixty-minute drive along the beautiful coastline from Montego Bay brings guests to the stunning beauty of the most blissful beach in Jamaica, “Bloody Bay.” The resort is a tropical paradise of gardens, flowering plants, pristine beaches, and secluded rendezvous locations. Adults looking for an intimate and serene getaway will find it at this resort, which has been named one of the top ten most romantic destinations in the Caribbean by TripAdvisor.com. 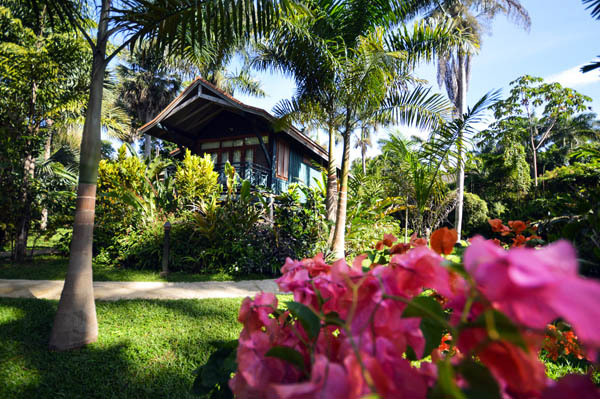 A chief attraction is the resort’s 85 deluxe “treehouse-style” guestrooms and elegantly appointed split-level suites. Accommodating staff members keep the rooms in top condition and attend to their guests’ every need. Cozy furnishings, air conditioning, modern bathrooms, balcony daybeds, and complimentary WiFi may lure some guests into lazing around the room, but the real fun is in getting out and enjoying all the resort has to offer. Let the day begin with a stop at the Blue Coffee Bar for a fresh cup of coffee or a steaming cappuccino. Then head to the pool or take a stroll down to the pristine, two mile, white sand beach and private beach club, and become one with the Jamaican sun. Guests can envelop themselves in the quiet sounds of the Caribbean gently lapping against the shore, or enjoy the clear water through swimming, snorkeling, kayaking, and windsurfing. Order a light, beachside meal and refreshing drink from the Palm Breeze Beach Bar & Grill, a cool drink from the poolside swim-up bar, or head back to the resort and partake in any of the casual to fine dining options. 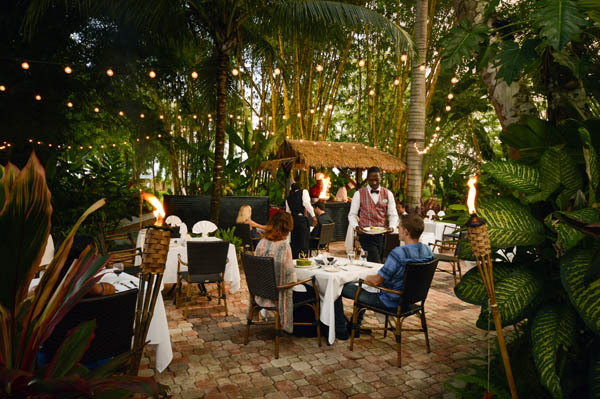 The Palm Grove Restaurant is an open-air dining pavilion, which offers buffet-style breakfast, lunch, and dinner. More formal nighttime dining options include a la carte items from the Lotus Leaf’s eclectic fusion menu and the intimate Chef’s Showcase Under the Stars, featuring authentic local cuisines and produce, cooked up with a Mediterranean twist. Libation options include the Bamboo Bar and the Irie Martini Bar, featuring martinis made with Jamaican Appleton rum. No resort stay is complete without a trip to the spa, and Sunset at the Palms offers one of the best at the Ginger Lilly Garden Spa. Soothing facial treatments, beauty salon pampering, and refreshing massage treatments all add to the sensory experience of the resort. Luxuriate in a full day spa experience, stimulating scrub, refreshing body wrap, or Sensory Magic Pedicure. Not to be missed is the Ginger Lily Coffee Scrub, a blend of Jamaica’s famous Blue Mountain Coffee infused with pimento essential oil. Entertainment options range from enjoying soothing piano music, working out on the Cybex equipment in the resort’s on-site gym, playing a rousing round of tennis, or dancing the night away to reggae music and a live Caribbean band. 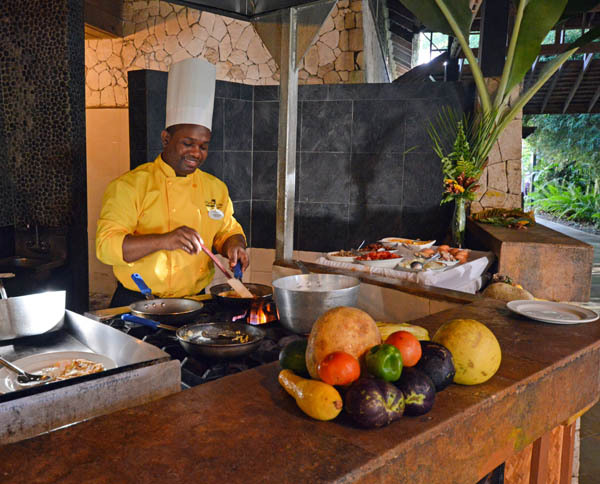 The resort also offers traditional Jamaican cooking classes, bartending classes, or a horticultural tour. The concierge will happily arrange exciting golf, horseback riding, canoeing, diving, mountain biking and other off-site excursions. Finding the perfect place for your next vacation need not be stressful. Take a small leap of faith and accept that the world of an all-inclusive experience reimagined by Sunset at the Palms. Allow yourself a vacation where you do not need to compromise your desire to enjoy a home away from home with all the added opportunities to be pampered by a staff that genuinely finds pleasure in making you feel part of their extended family as well as a very special guest.